LiVened Up shares several potato juice recipes to treat many issues such as blemishes and wrinkles, eczema, puffy eyes and tired skin, arthritis and join pain, cholesterol, ulcers, gray hair and hair loss, weightloss, and much more. 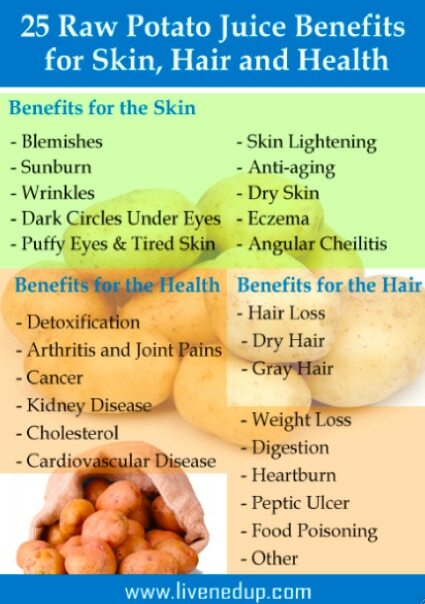 If you have any skin, hair or health issues then review the list of benefits of potato juice and see if it’s right for you. Depending on your need, potato juice can be ingested or applied directly to skin or hair. Of course, we recommend that you use organic potatoes for any application.